Sue Wilson-Finishing Touches Collection-Bold Scrolled Vine. Designed by Sue Wilson these cutting dies are an elegant collection of high quality steel designed to co-ordinate with each other. 2 dies. Size: 1.25" x 3.25". Craft die from Stampendous featuring a hummingbird and a flowery vine. 3 precision, stainless steel dies that leave a narrow border around each image. If you collect hearts, this die template is for you! Use just the border die for a classic heart shape. Nest the two die templates for a beautiful intricate design. Spellbinders Shapeabilities Die D-Lites cut, emboss and stencil with a single die template. Approximate Die Template Sizes: Inset: 2 7/8" x 2 3/4", Border: 3" x 2 7/8". 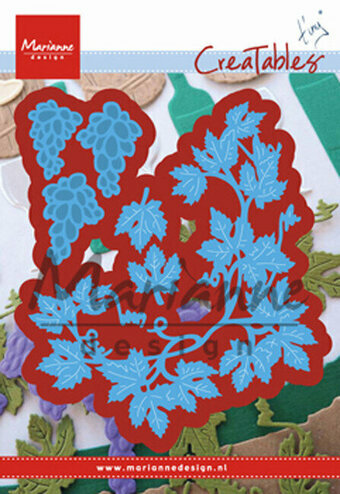 Craft die featuring a vine with leaves. Pretty and innovative cutting dies to help you create beautiful cards, scrapbook pages and other handcrafted projects! Can be used with most die cutting machines. Wedding themed paper craft die featuring doves. CottageCutz are thin metal dies, like a QuicKutz. They are easy-to-use and add great detail to any craft project. This die is compatible with the following machines: QuicKutz Squeeze, Revolution, Sizzix / Ellison Big Shot, BigKick, CuttleBug, SpellBinder Wizard and Accucut Zip'eMate. Adapters/shim may be required on some machines. Made in the USA. 100% lead free. Kaisercraft die featuring a bird with a bird cage. These steel dies will cut through cardstock, thin chipboard, felt, acetate, sticky back canvas, sandpaper, foam and much more! They work with virtually any die-cutting machine that will accommodate wafer-thin dies and are sure to become an essential ingredient in your paper crafting process. The Spring foliage die set is comprised of 4 versatile leaves. Use them to add depth and fullness to floral designs. 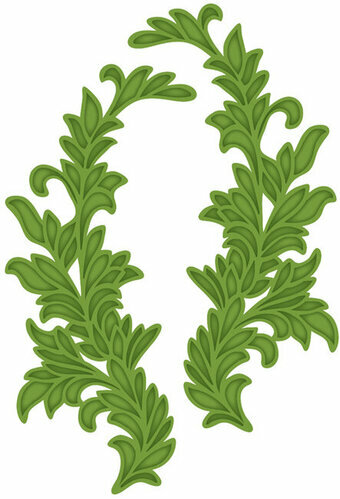 The curved fern leaf measures approx. 0.875" x 2". The two veined leaves measure 0.55" x 1.85" and can be layered to give you a 2-tone effect. The swirly vine measures approximately 0.875" x 2.3". Our Frantic Stamper Precision Dies work in most consumer table top die cutting machines. Some dies may require the use of a metal shim depending on your machine. Tattered Lace Dies are the most detailed and delicate dies on the market. They are beautifully co-ordinated with a distinctive look and can be standalone or used to complement existing dies in your collection. Tattered Lace dies have a non-stick coating that allows the card to release without the need for wax paper or tumble dryer sheets. Use with a variety of different card, fabric and materials to create stunning effects for your cards, home decor and scrapbook pages. This die measures approximately 2 x 4.7 inches.